When I go shopping with my girlfriend, she knows that I am almost always going to make a beeline for the toy department. Occasionally she will make a detour into the Barbie aisle to reminisce about her childhood memories of making Barbie and Ken "do it". On this particular outing, she brought something back with her when she found me in the action figure aisle. "Stove Top to Tabletop" Barbie. 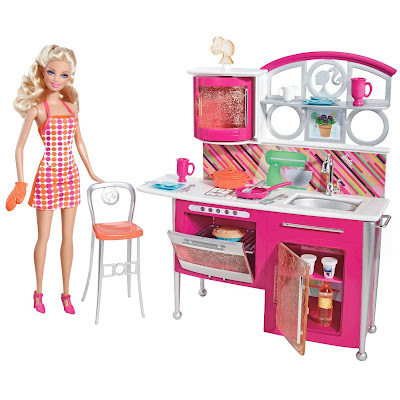 The set looks harmless enough upon first glance - that poodle chef looks somewhat suspect - but let's take a look at this same box from the assumed height of a child. 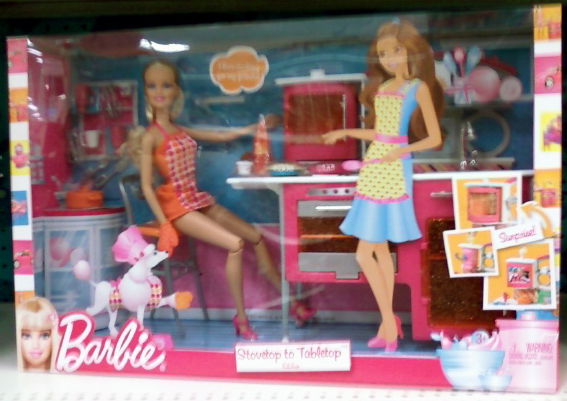 Note to retailers: don't stock this Barbie above eye level. If you run across something strange or interesting in the toy aisles, drop us an e-mail and we might feature your discovery in the next Aisle Show You.